The South African government insisted on Monday that relations with Rwanda were now “cordial” even though the two countries had not yet returned the 10 diplomats which were expelled by both sides over a year ago. South African Minister of International Relations and Cooperation Maite Nkoana-Mashabane said that relations were cordial because both ambassadors remained at their posts in their respective embassies. In May last year South Africa expelled three Rwandan diplomats and one Burundian diplomat whom it linked to a raid on exiled Rwandan General Faustin Kayumba Nyamwasa’s Johannesburg home. Rwanda retaliated by kicking out six South African envoys from Kigali. This left just the two ambassadors as the sole diplomatic representatives of their countries in Kigali and Pretoria. That is still so. The minister was asked whether full diplomatic ties had been restored, at a media briefing in Johannesburg today. She said that the fact that the two ambassadors were still at their posts meant that diplomatic relations between the countries were cordial. She and her Rwandan counterpart Louise Mushikiwabo had had a “very nice dinner” last week in Addis Ababa and were working together closely as members of a special African Union committee which was trying to end the civil war in South Sudan. “We have re-committed to keeping our diplomatic relations cordial,” Nkoana-Mashabane said, suggesting that the absence of all but the ambassadors from the two embassies was merely a technical matter. She added, however, that the security agencies of both governments were still discussing the security issues between the two countries. South Africa’s expulsion of the Rwandan and Burundian diplomats was the last straw, coming after Pretoria had failed to react to at least two attempts on the life of Nyamwasa in 2010 and the murder of his colleague Patrick Karegeya on New Year’s eve, 2013. He was also a former top military officer whom, like Nyamwasa, fell out with Rwandan President Paul Kagame and fled the country. Nkoana-Mashabane was mainly briefing about South Africa’s chairing of the AU Peace and Secutiry Council for the month of July. Last week the council met to discuss the South Sudan civil war and decided not yet to release a controversial report by former Nigerian President Olusegun Obasanjo into human rights atrocities committed during the war. Instead the council decided that the council should meet at heads of state level during the third week of August to decide what to do about Obasanjo’s report. But Nkoana-Mashabane insisted that the council was not letting the perpetrators of atrocities off the hook or allowing impunity for what they had done. The report would eventually be made public she claimed. The report is believed to implicate both sides in the war – President Salva Kiir’s government as well as the opposing faction led by his arch-enemy Riek Machar – in major human rights offences. Last month, however, Machar himself urged the AU to release the report as soon as possible, suggesting that the atrocities by Kiir’s force far exceeded those by his forces and that the report held Kiir personally responsible, while it did not hold him personally responsible. 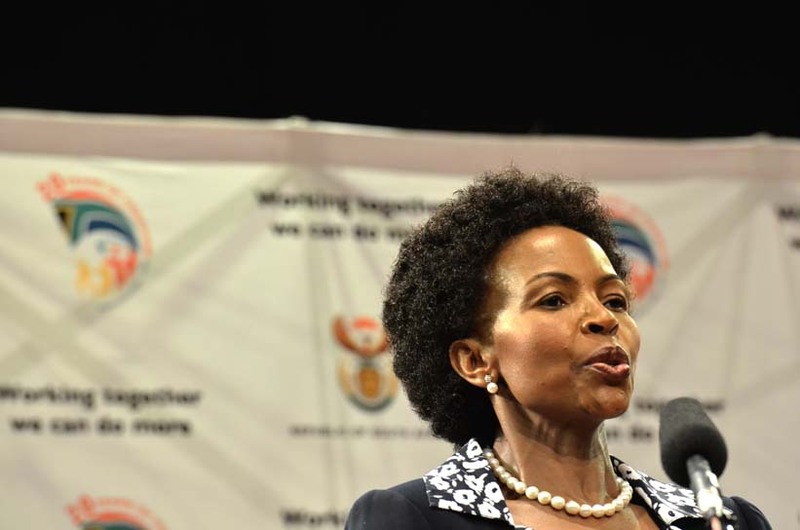 Nkoana-Mashabane said the council had not released the report last week – after also deciding not to release it in January – because it believed the report should be part of a political process lead by responsible governments on how to deal with the civil war in South Sudan. The minister also took a rare, sideways swipe at South Africa’s Brics partner Russia over its military involvement in Ukraine. She was asked by a Russian journalist if the AU intended to deploy its standby forces in South Sudan to quell the violence. She retorted that unlike Russia in the Ukraine, the AU believed in exhausting all possibilities of negotiating peace, before resorting to military intervention. Brics – the Brazil, Russia, India, China and South Africa forum – has so far refrained from explicit criticism of Russia’s annexation of Ukraine’s Crimea region and its alleged military support for pro-Russian separatists fighting Ukrainian troops in western Ukraine. The minister’s off-the-cuff response to the Russian journalist’s question was perhaps the clearest expression of Pretoria’s true feelings about Moscow’s military adventure.